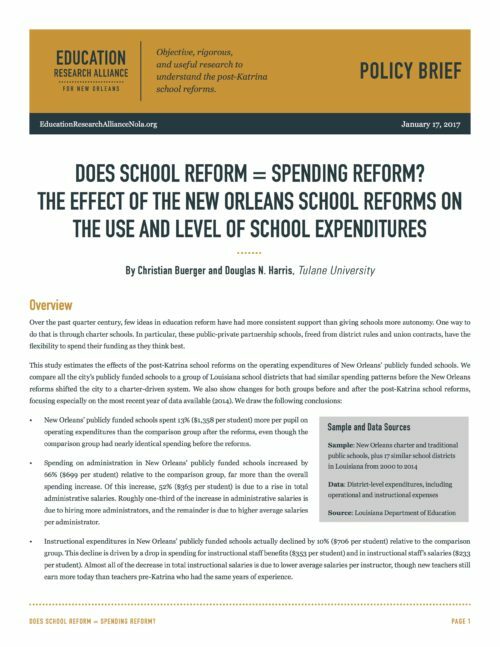 A policy brief and technical report by Christian Buerger and Douglas N. Harris on the effects of the post-Katrina school reforms on the operating expenditures of New Orleans' publicly funded schools. Over the past quarter century, few ideas in education reform have had more consistent support than giving schools more autonomy. One way to do that is through charter schools. In particular, these public-private partnership schools, freed from district rules and union contracts, have the flexibility to spend their funding as they think best. New Orleans’ publicly funded schools spent 13% ($1,358 per student) more per pupil on operating expenditures than the comparison group after the reforms, even though the comparison group had nearly identical spending before the reforms. Spending on administration in New Orleans’ publicly funded schools increased by 66% ($699 per student) relative to the comparison group, far more than the overall spending increase. Of this increase, 52% ($363 per student) is due to a rise in total administrative salaries. Roughly one-third of the increase in administrative salaries is due to hiring more administrators, and the remainder is due to higher average salaries per administrator. Instructional expenditures in New Orleans’ publicly funded schools actually declined by 10% ($706 per student) relative to the comparison group. This decline is driven by a drop in spending for instructional staff benefits ($353 per student) and in instructional staff’s salaries ($233 per student). Almost all of the decrease in total instructional salaries is due to lower average salaries per instructor, though new teachers still earn more today than teachers pre-Katrina who had the same years of experience. Transportation spending and other expenditures, which typically include contracts to outside firms, each increased by 33%. However, student support expenditures and maintenance were largely unchanged. The fact that instructional expenditures have decreased despite a large increase in operating expenditure is striking. The increase in administrative spending also suggests either that the lack of economies of scale has posed a real challenge in this decentralized system or that the educational models of charter schools involve higher management costs and perhaps a more top-heavy approach. There is no one right way to use educational resources, and it is worth noting that these changes in spending levels and patterns came alongside a large improvement in education outcomes for students. Still, these results are somewhat surprising given the common concern that traditional school districts spend too much on large bureaucracies. We find that charter schools spend even more in that area. Whatever the reasons, it is clear that the post-Katrina reforms led to more spending in total and different spending patterns in New Orleans’ publicly funded schools.